Be the first to share your favorite memory, photo or story of Marlan. This memorial page is dedicated for family, friends and future generations to celebrate the life of their loved one. 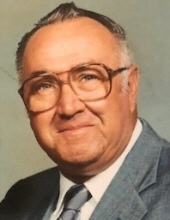 Marlan W. Pennington, age 80, a longtime resident of Plainfield, IL, formerly of Naperville, IL, passed away peacefully on Friday, April 5, 2019 at his home at Rock Run Memory Care in Joliet, IL. He was born on August 27, 1938 in Plainview, NE. Beloved husband of the late Nancee R. Pennington (nee Linder), whom he married February 29, 1964, loving father of Guy (Annette) Pennington of Plainfield, IL and Nora (Donald) Vercelote of Braidwood, IL, cherished grandfather of Donald, Hannah and Vincent Vercelote; Andrew and Lindsay (fiancé, Toby Weiner) Pennington, adored great-grandfather of Olivia and Sophia Weiner; devoted son of the late John and Verna Pennington, dear brother of Arleta E. Pennington, brother-in-law of Virginia (Michael) Marriott and Pattie Toland, fond uncle, great-uncle and friend of many. Marlan grew up in Wheatland Township, was a 1957 graduate of Naperville Community High School and served with the U.S. Army 1st Armored Division at Fort Hood, TX from 1961-1963, primarily as an equipment transporter. He was honorably discharged from the Army Reserves on November 18, 1966. A proud member of The International Brotherhood of Teamsters, Local #705, Marlan worked for United Parcel Service (UPS) for 34 years, retiring April 1, 1994. He was a member of the prestigious Circle of Honor, awarded by UPS for his safe driving over his career. In his younger years, Marlan served as commissioner of Plainfield Little League, was a scoutmaster of Boy Scout Troop #82 and was a board member of the Plainfield Athletic Booster Club from 1980-1982. Marlan was a member of Plainfield Congregational Church and the American Legion Marne Post #13, both in Plainfield and Moose Lodge #1368, St. Charles, IL. He enjoyed collecting tractors and working in his yard. Visitation will be held Friday, April 12, 5:00-8:00 PM at Overman-Jones Funeral Home & Cremation Services, 15219 S. Joliet Rd. (corner of Routes 30 & 59), Plainfield, IL. Additional visitation Saturday, April 13, 10:00-11:00 AM at the funeral home. Funeral Services will follow Saturday, 11:00 AM at the funeral home with Rev. Dr. Melbalenia Evans officiating. Interment: Plainfield Township Cemetery, Plainfield. To send flowers or a remembrance gift to the family of Marlan W. Pennington, please visit our Tribute Store. "Email Address" would like to share the life celebration of Marlan W. Pennington. Click on the "link" to go to share a favorite memory or leave a condolence message for the family.